Akoonu for Sales is designed to help account-based sales practitioners execute on their ABM initiatives by bringing all the buying signals together in a single location to gain a deep understanding of the buying committee. The platform is able to analyze all historic fields, which enables users to identify gaps in their deals based on their past closed business. The core workflows are powered around deal inspection and pipeline inspection—which touch every level of the sales organization. The company offers sales reps a single page to provide insight on a prospective account. Integrated with the their Akoonu marketing platform, the solution also suggests plays reps can run to help accelerate a deal. For sales managers, the solution can provide a quick assessment and gap analysis within deals to immediately enable managers to coach reps through the sales process. For sales executives, Akoonu for Sales brings buyer signals into a single location for more context in sales and pipeline forecasting. The platform itself is built in Salesforce, and incorporates data from marketing automation platforms, such as Pardot and Marketo, along with custom API-driven integrations. Akoonu for Sales is projected to cost roughly $30K on average for a small sales team, then additional reps can be added. There are platform and per-user fees, and the company provides complimentary supporting licenses. The solution is for sales reps doing account-based selling in complex B2B environments, and companies that have long buying cycles with complex deals and constantly moving pieces. Current clients include Traackr. Akoonu focuses heavily on opportunity management and working on deal execution. There’s a lot of tools out there for forecasting, but Akoonu for Sales is designed to help sales teams close the deals they forecasted. Being able to blend buying signals with the sales process positions sales teams to focus on the deal and tie the buying journey with the sales process. 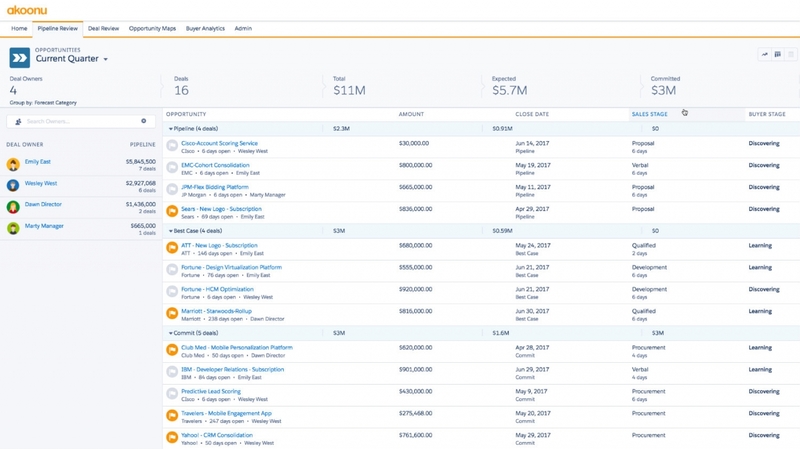 Akoonu for Sales is one of the only solutions built natively on Salesforce Lightning. It removes the need for IT involvement and streamlines the implementation process.